Each masonry or waterproofing project has its own special set of conditions, whether its structural integrity, moisture infiltration, or for esthetics. TWR is committed to the client through our ability to evaluate the problem, extensive knowledge of materials, experienced trained craftsmen and personal customer service. We will work with your schedule and budget to maintain your property correctly. New Masonry Work: steps, chimneys, walkways, stonewalls, retaining walls. Masonry Restoration: cut and repointing of mortar joints, brick or stone repair/replacement, historical restorations/preservation, surface cleaning, flashing replacement, steel or stone lintel repair/replacement. 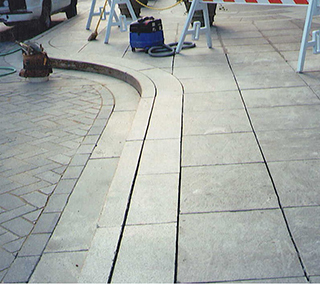 Concrete Restoration: concrete scaling/spalling and crack repair, epoxy/urethane injection systems, deteriorated concrete replacement ,expansion/control joint repair, sealers and elastomeric coatings. Waterproofing: leak detection/leak investigation, caulking/sealants, clear penetrating water repellant sealers, flashing installation, positive and negative side foundation leak repair.